The statistics are sobering. According to the Center for Disease Control, there are approximately 3,500 drowning deaths in the U.S. each year. And that’s just drowning deaths. Another 5,000 receive emergency care services for injuries incurred while in a swimming pool. Sadly, the CDC estimates that over three-quarters of drowning deaths involve those under the age of five. In fact, a child is more likely to die in a swimming pool than from a motor vehicle accident. For those under the age of 15, 75% of these drowning deaths occurred at a private residence. 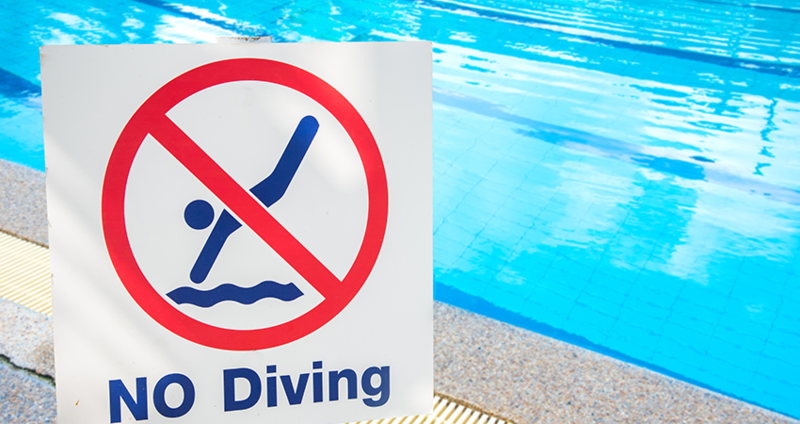 Fortunately, there are quite a number of things the pool owner can do to ensure his or her home does not become the site of another statistic. All swimming should be supervised (that includes adult swimmers as well). At the very least, insist that all swimmers employ the buddy system. Make sure that no swimmers are consuming or have consumed alcohol. Beware of any swimmers prone to seizure disorders. Install proper barriers (and maintain them properly), with alarms that signal if that barrier has been breached when the pool is not in use. Do not assume floaties and similar type items work as safety devices. They do not. Remove the diving board. It poses unnecessary risks. Maintain the pool properly so that swimmers (and rescuers) can see clearly. Make sure the pool is not overcrowded. Ensure that your pool is well-marked (e.g., accurately shows the depth of the water). Avoid drain (circulation) entrapment by having up-to-date drain covers as well as a safety vacuum release. Keep the pool well lit at night. Never allow swimmers in the pool during a thunderstorm. Always keep all necessary emergency medical equipment nearby. Keep toys away from the pool. They are too tempting for children. Never allow anyone to dive in shallow water. Secure all steps and ladders to the pool. Employ a motor-powered safety cover when the pool is not is use. Use pool alarms and make sure they can be heard both inside and outside of the house. If a child is missing, look in the pool first! Take relevant photos of the pool, equipment, signage, etc. IT IS VITALLY IMPORTANT THAT YOU TALK WITH A SWIMMING POOL ACCIDENT ATTORNEY PRIOR TO ACCEPTING A SETTLEMENT FROM THE INSURANCE COMPANY. Attorneys who have experience in handling cases involving swimming pool accidents are uniquely qualified in determining the cause of an accident; with whom the fault may lie; how much compensation is necessary to cover present and future medical needs, lost wages and property damage; as well as negotiating a settlement with the insurance companies or litigating a case in court. At Cappuccio & Zaorski, we have the experience and the legal know-how to represent you in your pool-related accident and to help you get the compensation to which you are entitled. Our success is based in part on the fact that we have prior experience working for insurance companies, so we are well aware of how the other side seeks to resolve, negotiate and/or litigate such cases. In short, we offer a strategic insight that other attorneys simply may not have. Most important, as a client of Cappuccio & Zaorski, we are committed to your immediate and long-term well-being and will do everything within our power to help you get through this stressful period. If you would like to discuss matters pertaining to a swimming pool accident injury, contact us for a free consultation at 609-561-5005 or submit the form on the right hand side. Cappuccio & Zaorski represents clients of South Jersey, including residents of Hammonton, Mays Landing, Egg Harbor City, Egg Harbor Twp, Folsom, Mullica, Winslow, Collings Lakes, Newtonville, and Atlantic, Camden, Burlington and Ocean Counties. Cappuccio & Zaorski represents clients of South Jersey, including residents of Hammonton, Mays Landing, Egg Harbor City, Egg Harbor Twp, Folsom, Mullica, Winslow, Collings Lakes, Newtonville, and Atlantic, Camden, Burlington, Gloucester and Ocean Counties.